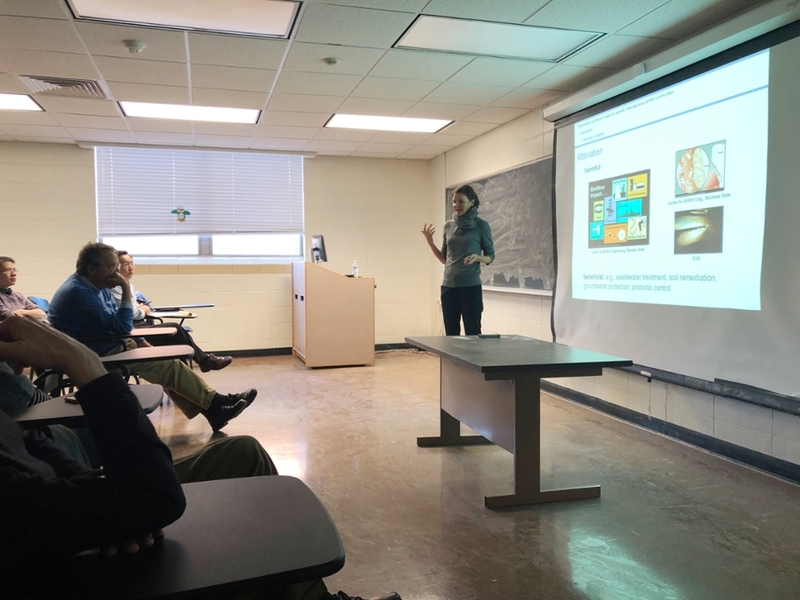 For its first colloquium of the semester, the Auburn University Department of Mathematics and Statistics recently hosted Dr. Stefanie Sonner from Radboud University Nijmegen in The Netherlands. During the Jan. 11 colloquium, titled “Deterministic Continuum Models for Spatially Heterogeneous Biofilm Communities,” Dr. Sonner discussed the important role biofilms play in various natural and industrial systems and mathematical models for their growth. “More than 80 percent of bacterial cells in typical water ecosystems live in biofilm communities and not as free-loading bacterial cells,” Dr. Sonner explained. During the colloquium, presented by Mathematics professor Xiaoying Han, the prototype growth model was discussed as well as several more recent multi-species extensions that take further biofilm processes into account. Analytical results were also shown and numerical simulations presented to illustrate the model behavior. Dr. Stefanie Sonner from Radboud University Nijmegen in The Netherlands speaking at Auburn University.